Updated after the death of the “Dear Leader” Kim Jong-Il. As the world speculates over what makes “Brilliant Comrade” Kim Jong-Un tick, I figure it may be worthwhile to give this 1994 cable a re-read and remember that the next leader of North Korea won’t necessarily be better than the last. This optimism stemmed from the belief that Kim Il-Sung’s son, Kim Jong-Il would steer North Korea in a more pragmatic and engaged direction than his father. 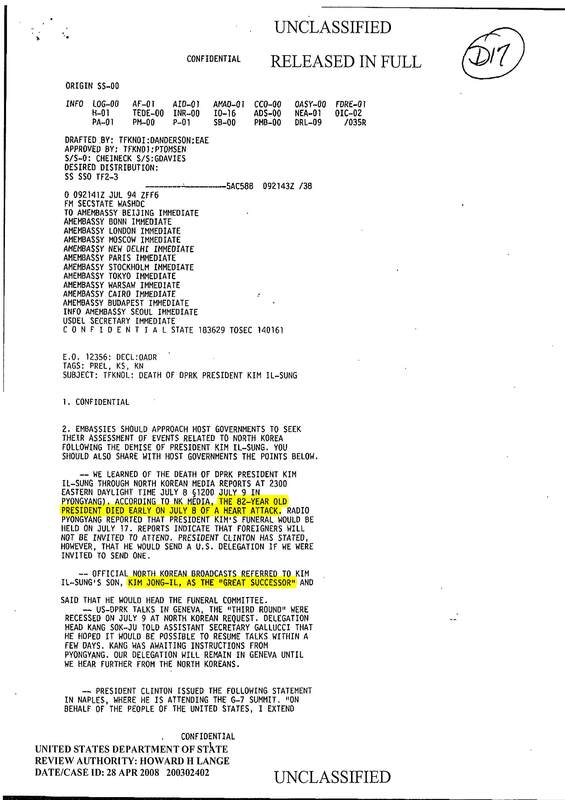 In fact, an earlier 1990 Department of State memo entitled “Kim Jong-Il Takes Charge,” gave Kim Jong-Il almost complete credit for Korea’s recent foreign policy engagement. 9 July 1994 State Department Cable announcing Kim Il-Sung's death. 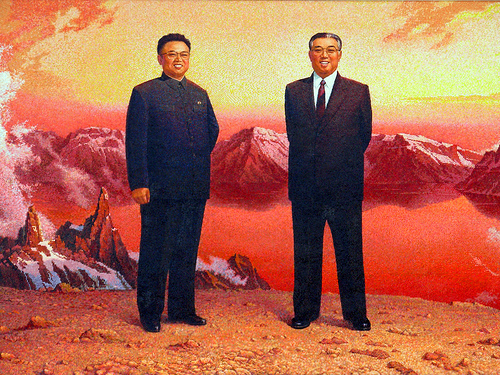 The 1994 cable announced that Kim Il-Song’s death was due to a heart attack. (Not the softball-sized calcium deposit he was reported to have on his neck.) It also reported that Kim Jong-Il was being referred to by state media as the “Great Successor,” and that he was heading his father’s funeral committee—firm signs that he would be the next leader of North Korea. The cable also reported that there were “no signs of unusual military activity in North Korea or along the DMZ.” (Phew). 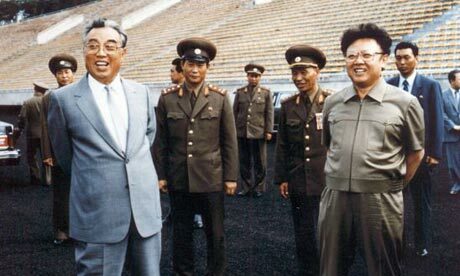 And that despite President Clinton’s willingness to send a delegation to Kim Il-Sung’s funeral, “foreigners would not be invited to attend.” North Korean television footage of the funeral portrayed it as an incredibly traumatic event; after I watched it, I had no doubts that Kim Il-Sung’s cult of personality was genuine. 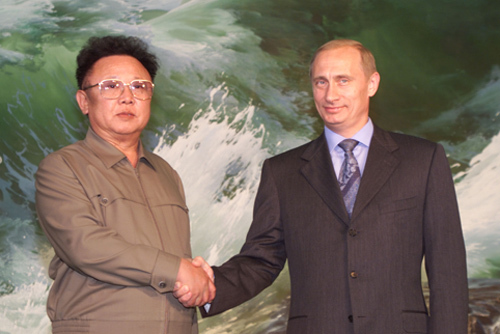 Kim Jong-Il and Vladimir Putin in Pyongyang. On another occasion, Kim -who is afraid of flying- traveled all the way to Moscow on an armored train. He had fresh lobsters airlifted to him along his journey. Kim Jong-Il “routinely shot three or four holes-in one” per round of golf, produced a film entitled Diary of a Girl Student, amassed a 20,000 videotape collection, composed six operas, kidnapped a movie star, was a self-proclaimed “internet expert,” stared in a Parker/Stone film, invented an invisible telephone, and ordered his World Cup coach to implement a cockamamie strategy that made his nation’s team lose embarrassingly 0-7. Let us hope that Kim Jong-Un –who cuts his hair like (and may have had plastic surgery to resemble) Kim Il-Sung– is a better successor than Kim Jong-Il.